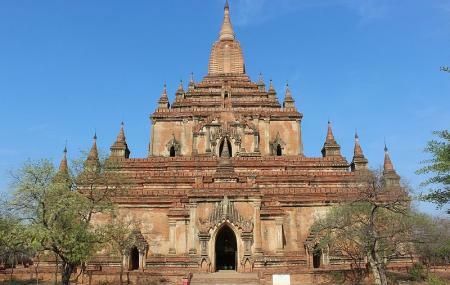 Once a highly visited destination in Bagan, the Sulamani Paya Temple was badly destroyed in the earthquake which shook Myanmar in August 2016. Even though the entry is blocked and the restoration work is yet to start, still you can visit the temple to get some peek a boo of the past. This particular temple offers a great view of the sunset. Hence, you should take your camera along with you, on your way here. Overall, a perfect place to pause for a bit and enjoy mesmerising locales. How popular is Sulamani Guphaya Temple? People normally club together Shwesandaw Pagoda and Dahmmayan Gyi Phaya while planning their visit to Sulamani Guphaya Temple. This 12th century temple is one of the most popular with tourists. It is built of brink and stone and has been extensively repaired after the 1975 earthquake. It is known for detailed frescoes in its interior depicting various images from Buddha's life. Near the temple there's a hill to watch and enjoy the beauty and amaze of mother nature,the sunset. Although there is way too much dusty, you will know later that it was worth to endure the dust once you see the awesomeness of Bagan's glorious view within the sunset. The hill is so-called Sulamani Sunset-watching hill as it is near Sulamani temple. You can find out the early architects, which is beginning from AD13. It is real.I can't told too many.If you reach there, you can see the valuable heritage of us.I can't give 5 stars, because there have no standard toilet.